Blogger-D was lucky enough to have a free work jolly to Le Café Anglais last Christmas and said the food was some of the best she’d ever tasted. 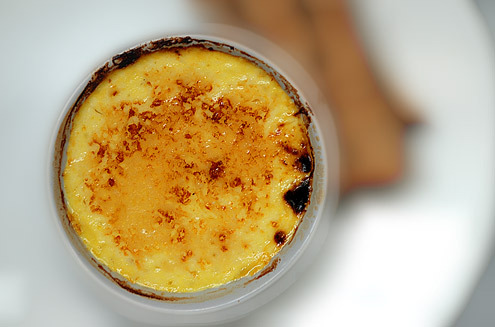 Blogger-R unfortunately has yet to be offered such a generous perk and so has had to content himself with making this – Rowley Leigh’s ‘signature’ dish of parmesan custard with anchovy toasts. Pre-heat the oven to 150 °C (gas mark 2). Mix together the cream, milk and all-but-one-tablespoon of the parmesan, in a heat-resistant bowl and heat slowly over a pan of boiling water until the cheese melts. Put aside and leave to cool completely. When cool, whisk in the egg yolks along with some salt, white pepper and cayenne pepper. Mix the butter and anchovies together into a smooth paste and spread onto 4 of the bread slices. Place remaining slices on top to form ‘sandwiches’. Stick under a grill and toast lightly on both sides. Cut into soldiers. 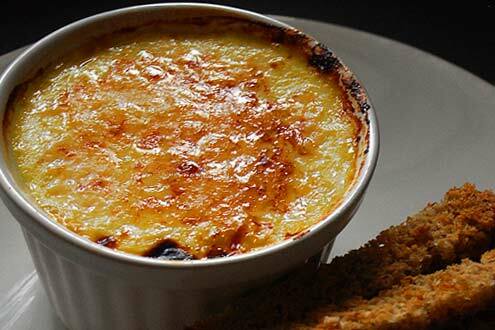 When the custards are cooked, remove the baking paper, sprinkle with the remaining parmesan and grill until browned. Verdict: An eggy, cheesey, custardy marvel. Anchovies too. Brilliant. Entertainment: Just plain good company. Oh – wow. I’ve eaten at Le Cafe Anglais and loved it. I sourced the recipe and planned to blog it but failed. I’ll get there eventually! Your version looks as good as his – very encouraging. I just want to eat it now. Delicious! What a fantastic, simple sandwich of butter and anchovies. This is such an interesting recipe. It sounds like a great appetizer. Your photos are gorgeous! Now I know why they call it the Yumblog! This looks incredible! wow i really love the flavours in this. it takes toy soldiers to an even higher level. gorgeous work!